I have been obsessed with Old Navy’s summer dresses this year. They have been so perfect and their prints have been on point. You probably know how much I like the resort wear look so all of these palm and tropical flower prints have been my jam. I ended up with three this summer (yes I know not that many but I had to limit myself!) and I want to wear them all the time. Luckily I got them all on sale too! First one I got was this black floral print dress with a tie neck. It’s perfect with either sandals or wedges and is nice and cool for when it’s hot. It comes in a couple other colors as well but a lot of sizes are almost sold out! Linked here! Second was this basic swing dress that is SO comfortable! There aren’t too many colors left but I want to buy another. It is so cute with some fun earrings and wedges, or even sandals or tennies! Linked here! Lastly is this fun little salsa dress. The off the shoulder detail and the bottom ruffle are just SO FUN! I need an actual event to wear this too, I just love it so much. I feel like I’m instantly on vacation when I put it on! A couple sizes are gone in this color, but black is fully stocked. Linked here! I can’t believe it’s August! Let’s enjoy the end of summer and welcome FALL SOON! PS- follow me on the the LIKEtoKNOW.it app so you can get all the links to my looks! 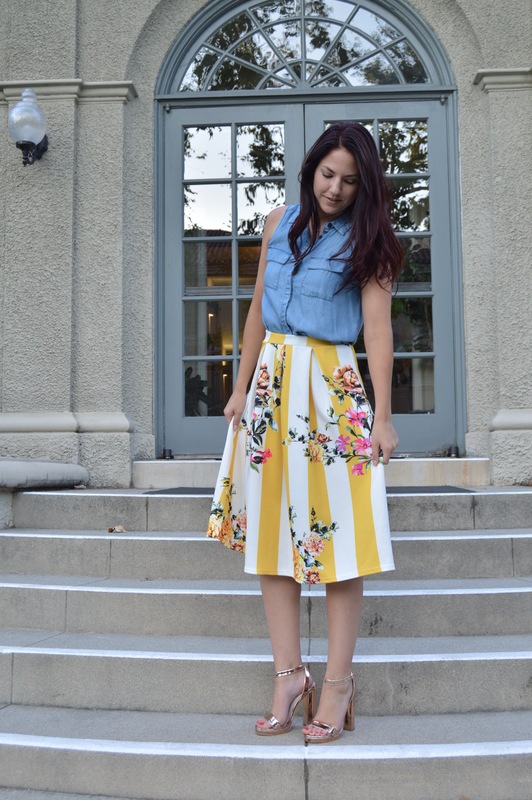 My favorite patterns to mix are stripes and florals. Something about those two together just calls to me. My got to is a black and white striped top with one of my three floral kimonos over, but yes I know you can’t mix ALL stripes and ALL florals, but it has been fun to try it in new ways. Some of my favorite denim shorts are my Topshop high waist “mom” jeans that have a big embroidered rose on each side. I think I have mentioned before that when I asked my sister if she liked them before I bought them, she cracked a joke about me wanting to be a camp counselor. Turns out she loves them now! Since these shorts only have two flowers they can hardly be called floral print right? So I took advantage to add in a third pattern. I paired a black and white striped tank, easy tucked into my camp counselor shorts, and added my cheetah print espadrille mules from the dv line for Target (linked here! PS- they run small, I got a half size up). They are not the big cheetah print, they are the small almost more polkadot like print. It may all sound weird but I think it worked. I have actually been able to add these shoes into a lot of outfits and they just work because the print really isn’t that loud. They are also SUPER comfy. Do you have favorite patterns you like to mix? Let me know because I need to branch out! I am doing the “scurry, sniff, FLINCH!” like Timon in The Lion King 1 1/2 duh! First, I wanted to make sure I posted about about my cute little wrap top! It is from BooHoo and is just perfect for fall. Not only is it good to pair with pants for work like I did here with the olive, but it is great for a casual look as well. I traded out the the work pants for black denim shorts (because fall in SoCal means still 100 degrees), a black choker, and black booties and boom, casual going out after work look. You know, because I go out so much after work… Anyways! The wrap top is linked here and is a really good price (look for the 50% off code)! Also everyone always asks me about these heels, they are Steve Madden but no longer online so I linked similar ones here! 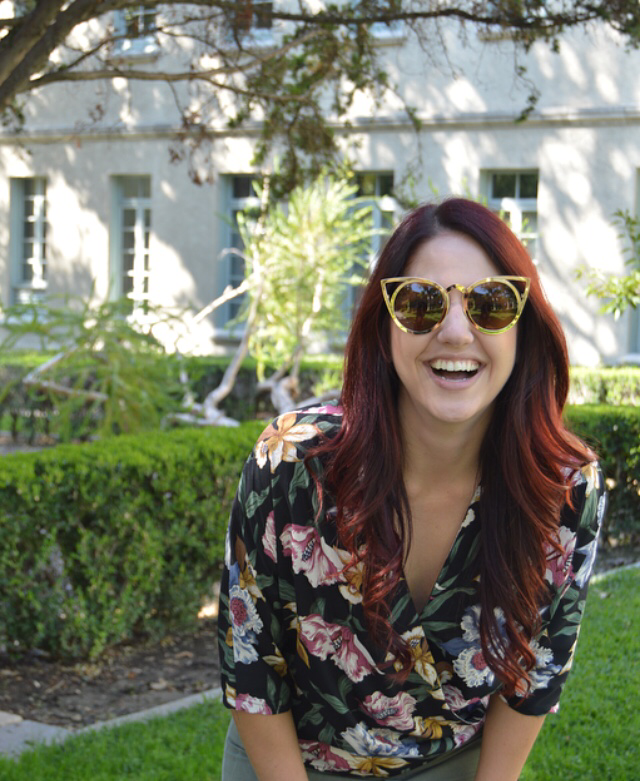 Second, can you please look at how cute these cat eye sunglasses are?! They are so fun and different. I love all of the funky sunglasses right now, they just add a little extra to your look. Mine are from Hashtag.Sunglasses. They were kind of hard to pick out because I couldn’t make up my mind out of all of the cute options. If you are curious check them out and use my code NewShades4You for 10% off your order. Mine are linked here and come in pink too! 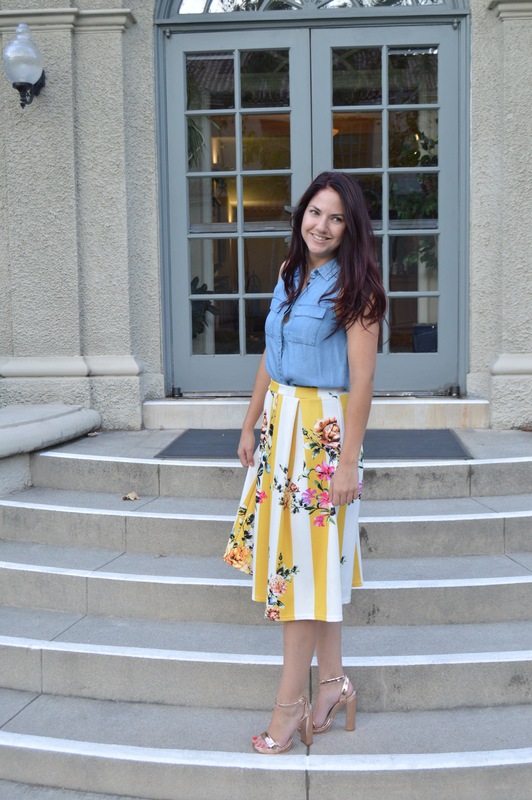 How cute is this midi skirt?! I wasn’t sure if it was too circus tent-y, but I couldn’t get it out of my head from the moment I saw it. I decided it was too fun not to buy. I wore it to work but it would also be great for dress up events like brunch, a bridal shower, or a birthday party. I got so many compliments on this outfit from the minute I walked in the door at work! I just loved it! Probably one of the best parts about it is how inexpensive the skirt is. I got it half off on BooHoo.com. I’m excited to see what other looks I can make with it. Check it out! I pretty much want to buy this dress in every color and print they have. I just love how pretty you feel in it yet you’re totally comfortable. It almost feels like a secret, like “yeah everyone thinks I look all good but really I wore this dress because I was lazy and it’s comfy,” you get me? If you missed my first post on this dress you can read it here. 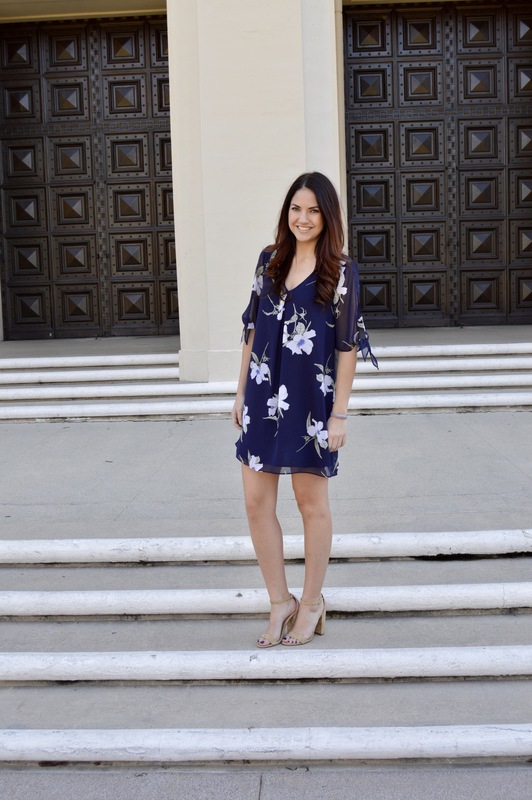 It’s just the perfect little shift dress that’s great for any dinner, brunch, bridal shower, anything! Anything except work for me… I’m tall but I wear a small so dresses are usually a little too short. I think if I got another color though and wore it with tights I’d be okay, I’ll test it out maybe. Anyways here it is linked again by Soprano at Nordstrom! Happy Hump Day! Happy Wednesday! We are half way there, just hang on a little longer! I wanted to share this cute little dress I got last week for a nice dinner. We had a friend take my boyfriend and I out to a really nice place called The Summit House and I was going crazy trying to figure out what to wear. I knew the restaurant was nice but I wasn’t sure how nice and most, or really all of my dresses were not right for the occasion. I recently got rid of quite a few and am in need of replenishment. 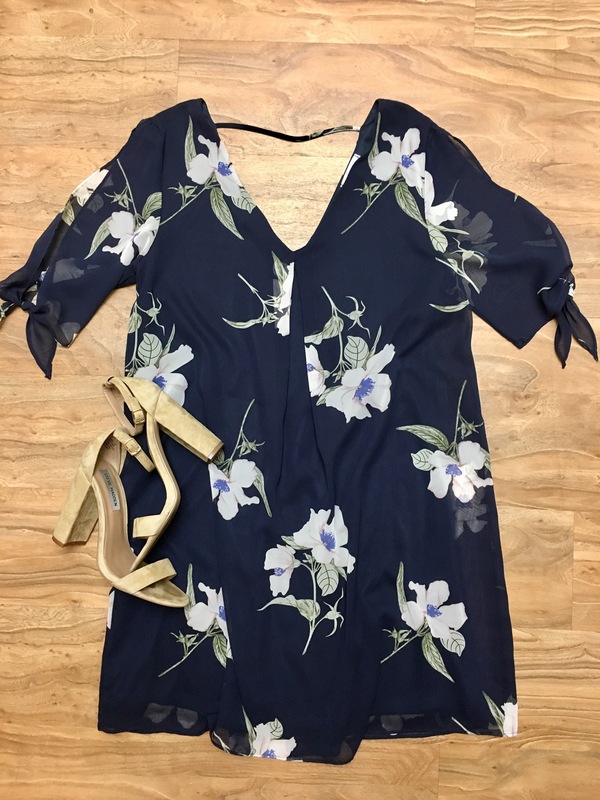 I found this loose navy, floral chiffon shift dress at Nordstrom for just under $50! The colors are still great for winter but the flowers make it okay for spring as well. When I saw it I instantly thought I could wear it with my tan Steve Madden heels. It looked super cute and was dressy enough and not over the top! The sleeves are super cute too, they are slit and tie at the bottom. I can’t wait to wear it again for a brunch. For anyone interested in sizing, I’m 5’8″ and I got a small and it was just long enough! My bffff found a couple of sheer floral kimonos at a store we go in from time to time called Citiwear. It is actually a store I worked at for 6 years back in high school and college. She sent me a picture of the kimonos in navy and in white. They were so cute and perfect I wanted one too! Of course when I got to the store they didn’t have anymore. Figures. They only had black which I didn’t really want. I went to a second store which is basically the same thing and again, they only had black. Well, I wanted one and black was all they had, so that is what I got. Turns out I love it! I usually don’t wear black that often so I always feel a little edgier when I do. This though feels so elegant and feminine. I feel so fancy when I put it on. What is so great about this kimono is that it is sheer and light which makes it perfect for spring and summer. I love layering, it adds such dimension to an outfit but it gets harder to do when it gets hot. That won’t be as much of a problem with this kimono. The neutral colors also make it great to go with so much. The last awesome thing about it is that it was only $10.99! Okay so shopping this look is a little hard. i couldn’t find the exact kimono online so linked is a similar one here. 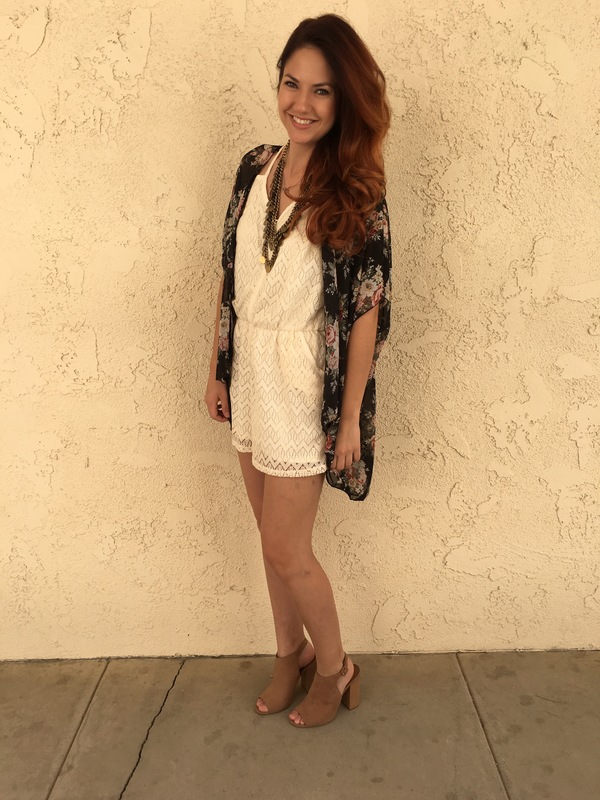 The romper is from Target last year but linked again is a similar one (which is SUPER cute!) here. Lastly the heels, which are my new favorite are linked here: Steve Madden CALLVIN. 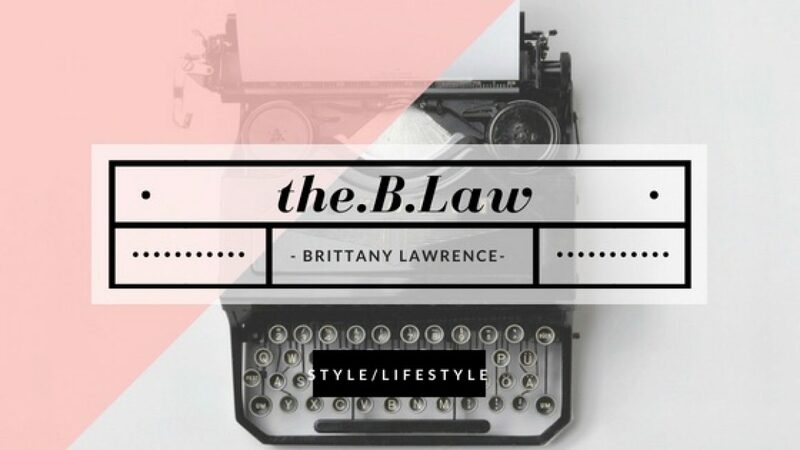 Click the B’ to follow me on Bloglovin’!